We wine lovers are always looking for those special bottles from small unknown wineries that no one knows about. These wines are termed “Diamonds in the Rough”. What should our term be if we find a small winery in a small wine community like Temecula California that is not only producing one varietal that is a success, but many? Such is the fact with a small winery in Temecula California called Briar Rose. The history of this property explains the quaintness and peaceful feeling that one gets when they arrive. The property was originally purchased in the 1970’s by Beldon Fields. Fields built replicas of cottages, like those found in Disneyland’s Fantasyland, for his wife. Fields was one of the artisans involved with building Fantasyland and Toontown at, you got it, Disneyland. In the early 1990’s, Les and Dorian Linkogle purchased the property from Fields with the stipulation that the cottages that he had designed and built on the property would remain unchanged. By now, you are probably beginning to get the picture on why the winery is called Briar Rose. In the Disney animated film Sleeping Beauty her godmothers sent her to the forest to protect her and there she was known as Briar Rose. When you arrive, you walk though a small peaceful garden setting toward a thatched roof cottage. Entering the reception room, we were warmly greeted by Kella the hostess and Dorian. Next, we were led to the tasting room. Again, the Disney theme from Sleeping Beauty is joined by another Disney favorite Snow White and continues to unfold as you sit down and are given the wine lists. Briar Rose tastings are by appointment as they want the guests to be able to sit down and truly enjoy the display of wines that are poured for you. It is easy to spend an hour or more talking with the staff, who are very well versed, or owners on each of the wines. Briar Rose has two (2) different tasting packages available. There is the Standard and the Premium. My recommendation, of course, is to try both. Briar Rose poured three (3) Cabernets as a vertical during our tasting adventure. The 2004, 2005 and 2007 were all great with each one displaying different characteristics. The 2004 was lighter than the other two which was caused by an extremely rainy season ,according to our Briar Rose staff member. The wine offered flavors of blackberry, currant, plums and spices. The 2005 had a lot more depth with tastes of big bold dark fruits, such as boysenberry and blackberry. The 2007 had flavors of black cherry and plum. Of the three Cabs, the 2005 was the biggest of the three years. What I found and enjoyed with all of them was that they were well structured, balanced with tannins that were soft and silky. I must say, a very enjoyable vertical. Les is very unique in his approach to creating wine masterpieces. He loves to think outside of the box and create unusual blends and wines. The first unique wine at this tasting, was called Temecula One. This wine is a blend of 40% Sangiovese, 40% Cabernet Sauvignon and 20% Merlot. This blend is modeled after the Italian Super Tuscan blend. The story on this wine is that it was served at a blind tasting at Caesars Palace /Harrah’s Club and won! Thus the name, Temecula One (won). The wine tasted great with flavors of plums, cherries, boysenberries and white pepper. I have always loved Les’s Sangiovese and every time I get up to Briar Rose, I stock up. Unfortunately, he was sold out on this visit, but not to worry I still have a few hidden away. Another adventure for one’s palate is a Hefe Vine called Talking Frog. Les used viognier grapes and fermented the wine using a beer yeast instead of a wine yeast. He calls it a wine lager. The result is a carbonated wine that has the typical green apple flavor of viognier. It is clean and extremely refreshing. In Disney style, the label says. “You have to kiss a lot of frogs to find your prince.” This was one I had to have in my cabinet and to share with friends. 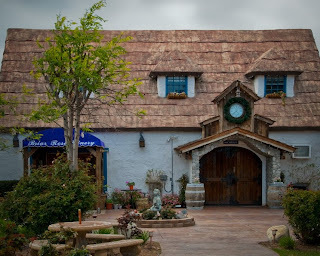 I challenge everyone to visit The Briar Rose Winery. I will guarantee you that you will not be disappointed. The atmosphere, professional nature of the entire staff will make you feel right at home. The wines as you can see from my review are in a league of their own. They have received numerous awards and they were even invited to pour at the Library of Congress in Washington DC. That’s what I call recognition. My overview of Briar Rose is that Les and Dorian want to concentrate on developing very special top quality wines. Whether it is the less expensive wines or their estate and library wines they have wines that will satisfy everyone’s palate. You can contact PixelPerfectInc.com for questions regarding this.